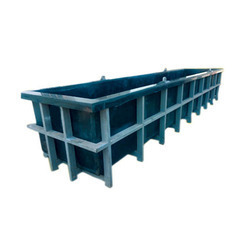 Manufacturer of a wide range of products which include hdpe tank and hdpe rectangular tank. We manufacture & export a wide range of Rectangular and Square Tanks in HDPE and PP which are primarily used for pickling purposes. HDPE tanks and PP Tanks are provided with MS structural support from outside to give external mechanical strength in the long run. HDPE tanks can withstand up to 60C & PP tanks can withstand up to 100C. These tanks can be made of any size as per the customer’s requirement and will be perfectly fitted inside the MS structural support. Further, we also quality test these tanks on various parameters to match with the international industrial norms.